Why is our bar so delicious? It contains real fruits. Are natural ingredients important to you? Then our Paleo Bar is right for you. No chemicals or added sugars. ** Instead it is chock-a-block full with valuable nutrients from organic fruit and nuts. That makes it not just unbelievably tasty, but also great for your body. The perfect fitness snack for workouts and everyday life. And a uniquely delicious alternative to traditional snacks. Why complicate things, when it is so simple? For our Paleo Bars, we trust in foods that nature has provided for thousands of years. We never heat them over 42 degrees to maintain their natural quality. That keeps all those valuable nutrients intact. Your new favorite fruit bar consists of our finest ingredients. How? It’s simple: With lots of love and care. First, the nuts are shelled and then thoroughly rinsed. Then we dry the dates and combine the ingredients to perfection. That is how we create the uniquely intense flavor of our bars. And then? Into the mixer. And blend. Basically the same as in your own kitchen. Only at a much bigger scale. Paleo nutrition focuses on foods that have been around since the Stone Age. The idea behind it: The foodstuff that drove our evolution is still good for us today. Paleo is all about food that is good for you. That means: high quality natural foods. Instead of processed foods with added sugar and chemical ingredients. This is what is put on the plate. Vegetables, fruit, meat, fish, eggs, nuts and seeds are at the heart of the paleo diet. Valuable nutrients. High-quality fats. Fibers. Complex carbohydrates. Protein. In short: Everything you need to feel really fit. And to look good. Energy To Go. Forget unhealthy snacks. You need an energy boost, but as usual there is nothing on offer but chocolate bars? Our Paleo Bars give you the kick you need. Completely naturally, of course. Made of dates, fruit and nuts. With valuable fats and filling fibers. In organic quality. Paleo-certified by the paleo experts at Paleo360. What we don’t put in? Added sugar, processed fats, artificial flavorings, etc. Forget that chocolate bar! *** Made of blackcurrant juice concentrate. Organic raw food bar with fruit and nuts. May contain traces of gluten, chicken egg whites, soy, and milk (lactose). Despite careful monitoring, this product may contain hard pieces of fruit, nuts, etc. Paleo Bars are the perfect fruit and nut snack between meals. Exotic and chocolaty or fruity and fresh: Our Paleo Bars come in the flavors coconut, cocoa, blueberry and passion fruit. The perfect flavor for every taste. 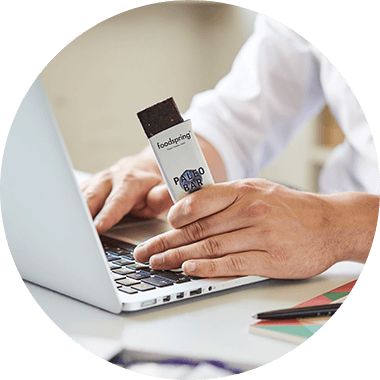 For our foodspring Paleo Bars, we insist on 100% natural organic ingredients, which are all gently processed. Organic quality paleo means sustainable agriculture and doing without chemical pesticides and any artificial additives or binding agents. Dried dates form the base of all of our paleo bars. They give them just the right level of firmness without overpowering the flavor of the bar. Nuts and fruit are perfectly balanced in every bar. Almonds, cashews and cocoa create an intense chocolate-nut flavor. Cashews, almonds and macadamia nuts underline the fresh, exotic flavor of our Coconut Paleo Bars. If you prefer fruity things, then you will love our blueberry and passion fruit bars. Fresh fruit pieces give both of these paleo bars their unique fruity flavor. When processing the dates, nuts and fruits, we insist on a gentle treatment for our valuable ingredients. That means: First, all of our ingredients are carefully rinsed, dried and peeled or shelled. All ingredients – sorted by type – are combined in a professional mixer and is blended until it forms a firm, but malleable mass. Basically the same way you would do it in your own kitchen. Only on a much bigger scale. After that, we shape our paleo bars. Our paleo bars are raw food quality. Temperatures are kept below 42°C during the entire production process. That means the vitamins and nutrients of the fresh ingredients remain intact. 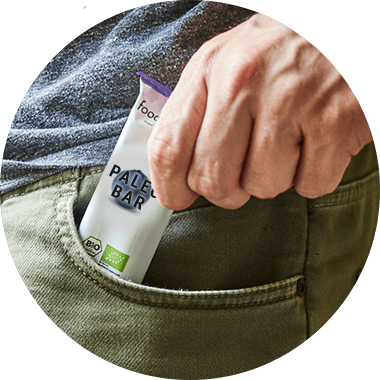 Your Paleo Bar will therefore be not just incredibly delicious, but also the perfect snack for your fitness lifestyle. Awarded the Paleo certificate by Paleo360 – Germany's leading paleo portal. “Paleo” is an abbreviation of Paleolithic – i.e. the Stone Age. Paleo nutrition therefore focuses on the foodstuffs available during the Stone Age. In other words: only those foods get on your plate that were around in the same or a similar form during the Stone Age. The basic idea: Eating the most natural and unprocessed foods possible. 2. WHAT IS permitted in a paleo diet? Basically, the paleo diet focuses on vegetables, fruit, seeds, nuts, fish, meat and eggs. Some interpretations of paleo also permit white rice and whole grain. In addition to the choice of foodstuffs, the quality of paleo foods is fundamentally important. Meat should be organically farmed, fish should be caught wild and fruit and vegetables should ideally also be organic. After all: there were no chemical pesticides or factory farming in the Stone Age. When you get started with a paleo diet, you will quickly notice that you are automatically eating much more consciously than before. That is great for your health and fitness. By deciding for or against certain foods, you take control and make sure your body gets what it needs to achieve your goals. On the paleo diet, you replace things like white bread, white pasta and traditional sweets with added sugars with delicious foods with lots more nutrients: vegetables, nuts and fruit. This is not just much healthier long-term, it will also mean that your taste buds adapt to your new diet over time and at some point you will no longer have cravings for sugar bombs and pasta. 4. 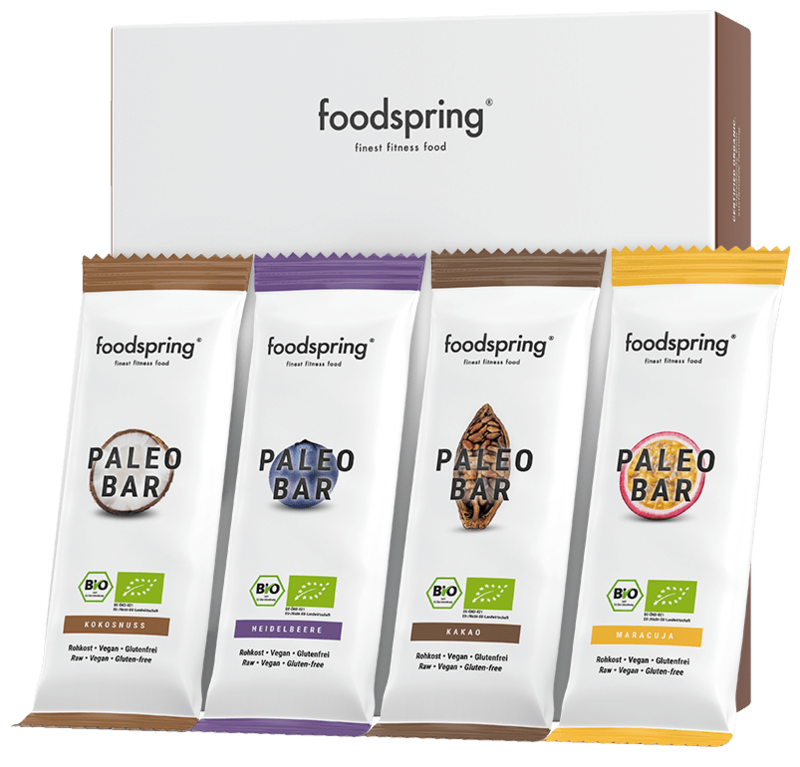 What does paleo quality mean in terms of foodspring Paleo Bars? Our Paleo Bars are made exclusively of ingredients permitted in a paleo diet. Free from grain, gluten and added sugars, they are based on organic fruit and nuts. When our ingredients are processed to make our Paleo Bars, we go one step further and ensure that the ingredients are never heated above 42°C. That is to ensure that all those valuable nutrients contained in each ingredient are kept intact. The “paleo diet” is growing in popularity. Nevertheless, it really isn’t a “diet” in the traditional sense of the word. In this case, the term “diet" simply replaces the word “nutrition”. However: Experience has shown that a healthy and well-balanced paleo diet will soon have you shedding extra kilos. Anyone, who incorporates more and more paleo dishes and snacks into their diet, will be consuming less added sugars and empty carbohydrates. Vegetables, fruit and nuts deliver all the valuable fibers your body needs and keep you feeling full for longer. No more sudden cravings for snacks! Also, empty carbohydrates that mess with your blood sugar levels and fat burning are completely eliminated from a paleo diet. If your goal is weight loss, you should definitely curb snacking. Paleo Bars are the perfect alternative to traditional sweet snacks with added sugars and are absolutely delicious. If you love chocolate bars: Why not try our Cocoa Paleo Bar! However, in some ways a paleo diet is no different from any other diet: You need to create a calorie deficit in your day if you want to lose weight. 70% nutrition, 30% training. This same basic principle applies for people living on a paleo diet. In other words: No training, no muscles. If you are dedicating your workouts to muscle building, then paleo nutrition can definitely help. The percentage of natural proteins is intrinsically high in a paleo diet. This is very good news during the muscle building phase. The nuts and seeds in the paleo diet in particular are great sources of valuable fats and will help you achieve the calorie surplus you need for muscle building. 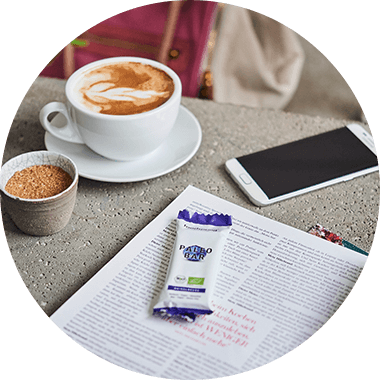 Our Paleo Bars deliver the quick readily-available carbohydrates you need after a workout and are the perfect natural alternative to sweets and traditional snacks. Why are your Paleo Bars better than traditional fruit bars? Because they contain no added sugar or syrup. Because our bars are 100% organic and raw food quality. And most importantly: because they taste amazing. How? By only using ingredients that naturally taste great. Depending on the bar you choose, coconut flakes, cocoa, macadamia nuts, and real fruit pieces create that uniquely delicious flavor in our Paleo Bars. Hazelnuts or raisins? Artificial flavors and other chemical enhancers? No way, never! What does paleo quality even mean? Paleo is a lifestyle that looks to the food and life choices of our ancestors in the Stone Age. The idea behind it is that the foods that fueled human evolution are still good for us today. For our bars, that means they’re made with ingredients that were available in the Stone Age or have not changed much since then. Dates and nuts form the foundation. Depending on the bar you choose, we add cocoa, coconut flakes, or fruit pieces. Tons of nutrients, no gluten, no chemicals, no unnecessary ingredients. What does the paleo certification mean? 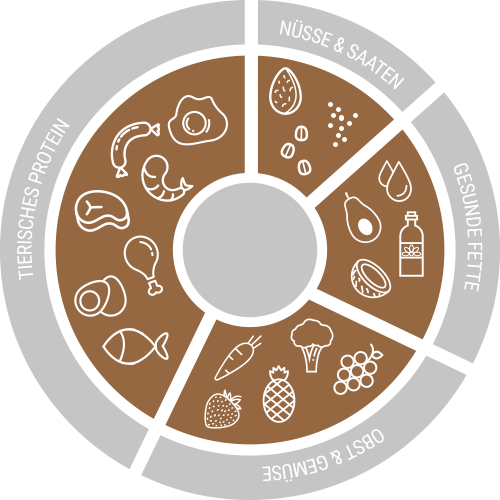 We get our paleo certification from Paleo360.de – Germany's leading paleo portal. The experts behind Paleo360 live the paleo lifestyle and are fully committed to their cause. They test the products very carefully and only certify foods that meet 100% of their strict paleo diet rules. Are the ingredients for your Paleo Bars chemically treated? No. After a thorough cleaning, our dates are dried and the nuts are shelled. After that, all ingredients are chopped up and shaped into bars. The whole process meets the strictest organic guidelines. No chemical treatments whatsoever. Where do the carbohydrates in the Paleo Bars come from? From natural fruit sugars. Most of the carbohydrates come from the dates that keep the bars together. Using dates in our bars means we can do without artificial binding agents or chemical additives. The carbs in whole dates give you the energy boost you need for getting through the day or a gym session. And because we use the whole fruit, our bar is also a good source of fiber. Paleo Bar 12 Pack will be back in stock shortly.